Tired of the old-fashioned cooking methods? If you want to try something new in the kitchen, why not go for either a pressure or a slow cooker. But you can’t invest in both, right? Though many homemakers prefer buying both for versatile cooking, you don’t always have that option. If you love home-cooked meals, what you need is a smart, efficient, and highly-effective cooking appliance. Only a cooker will match up to your cooking skills, so why not consider something that encourages “hands-off” cooking? Both a pressure and slow cooker making cooking easier, but each do it in a completely unique way. With this guide you’ll know which type of cooker is better for you. So instead to finding a clear winner among the competitors, try finding the features that suit your cooking style and habits. If you’ve spend a lot of time with the wrong kind of cooker, these pointers will help you upgrade to a better and more versatile appliance. Plus, it answers all your questions about pressure cookers and slow cookers, including the mystery of – which is the best? 2. What Can You Cook? 6. Do You Live At A High Altitude? How can you compare a pressure cooker and a slow cooker without knowing how they function. You should also know that using a pressure or slow cooker has more advantages over using an ordinary pot or a dutch oven for slow cooking. A pressure cooker uses a cooking method with pressurized steam. You will find an airtight seal on the top of the cooker which traps the vapor of the boiling liquid inside the cooker. The pressure accumulating inside the pressure cooker from the vapor raises the pressure and temperature for cooking more evenly. This speeds up the cooking process and while marinating and softening the food effectively. In hindsight, a pressure cooker cooks food 10 times faster than in an ordinary cooking pot. And when comparing flavor, it’s much tastier compared to other cooking methods. We like the T-fal P45007 Clipso, which is very easy to use and has a variable steam release valve. A slow cooker is much similar to a cooking on a stovetop. The slow cooker traps heat at the base, which flows up the sides of the cooker to heat and cook the food inside. It generally comes with a temperature setting which allows you to set a fixed temperature for cooking. The high and low heat settings on a slow cooker allow you slow cook a meal depending on its flavor. Slow cooking any meal takes more time than cooking on a pressure cooker. It consists of a base, heating band, and the cooking vessel. The lid lets out the steam, unlike in a pressure cooker which traps the steam to speed up the cooking process. 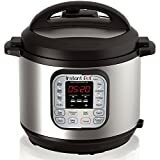 We like the Instant Pot IP-DUO60, a versatile multi-cooker that works very well as a slow cooker. It has energy efficient and decent sized with a 6-quart capacity. Knowing what works for each kind of cooker gives you freedom of choice. You can cook in a more relaxed way knowing what works the best for which ingredient or meal. So what’s cooking? In a pressure cooker, everything can be broken down into a delicious meal. This includes vegetables, meat, beans, and rice. High pressure cooking breaks down food faster than a slow cooker, which works for most beans and soft vegetables. You can cook rice in merely minutes, similar to with a digital rice cooker. And it softens harder foods such as chickpeas or beans in a matter of minutes. If you want to cooked marinated meats and other kinds of tenderized roasts, a pressure cooker saves time. But pressure cookers are famously used for cooking vegetable stews and beans and pulses. A slow cooker works best for meat and stews. Unlike pressure cooker, a slow cooker creates tenderized cuts of meat with more flavor and juice. This is so because a slow cooker takes its time to immerse all the ingredients together. You can add potatoes, carrots, or any kind of fresh vegetables in a slow cooker. However, tender foods such as pasta, squash, or asparagus break down very quickly when cooked. So it’s better to add these ingredients later on in a slow cooker. Maybe during the last hour of slow cooking can yield the best results. Seafood such as prawns, crabs, or fish should also be added during the last hour of slow cooking. This also includes dairy products such as cheese and sour cream. Cooking relatively harder ingredients is much effective in a slow cooker than a pressure cooked. Even if you have to add softer ingredients (like the ones mentioned above) toward the end of the slow cooking process. The energy consumption of each cooker is another important factor to take into consideration. It dictates how much energy you will be exhausting and how much you can save in the long run. This makes more sense to you if you cook regularly and are looking for ways to cut down on your utility bills. According to research, energy efficient pressure cookers use much less energy than a cooking pot. With a pressure cooker you can reduce your energy consumption by almost 70%. A slow cooker, on the other hand, take at least 7 to 8 hours to cook. But are they energy efficient when compared to pressure cookers? The answer is also yes! When you compare the efficacy of a pressure cooker and a slow cooker, the former is the clear winner. Slow cookers, as energy efficient as they are now made, takes a long time to cook. And a pressure cooker does the same kind of cooking, only more pressurized, to save cooking time and energy. On top of all the reasons mentioned above, you should also know that pressure cookers require small amounts of water for cooking than slow cookers. Pressure cookers focus on more heat accumulation to tenderize food. So a fraction of what’s needed in slow cookers is poured into a pressure cooker. If you pay your utility bills based on the amount of water you use every year, this is an important factor to consider. Some cookers come in smaller sizes, which are only useful for cooking curries, drips, etc. But for cooking large portions of meat or vegetable stew, you need a bigger than average sized cooker; whether it’s a pressure cooker or a slow cooker. But if you’re purchasing based on portability and size, this is what you need to know. There are 2 main types of pressure cookers: a stovetop and an electric pressure cooker. Both are available in same sizes, only that a stovetop pressure cooker requires an external heat source for fast cooking. An electrical pressure cooker consists of an integrated heating mechanism with a digital timer and temperature setting. In terms of size, if you’re using a stovetop pressure cooker, which is recommended by most people, you can also use it as a standard cooking pot. This saves space like you wouldn’t imagine! You can create all kinds of recipes, including desserts, in a stovetop pressure cooker. Electric pressure cooker, furthermore, don’t take up much space on your countertop. Since they cook food faster than slow cookers, they can be stored away in a cabinet right after use. Unlike pressure cookers, there are only electric slow cookers. This is because a slow cooker takes not less than 4 hours to cook a meal. It may very well go up to 10 hours, depending on what you’re cooking. A slow cooker consists of an energy efficient heating source which provides consistent heat throughout with the help of a timer and temperature settings. More importantly, people generally slow cook meat and vegetable stew. This means the larger the cooker capacity, the better. A multi cooker typically also has a slow cook function. Most slow-cooked recipes include tenderized meat and other full-course meals. So unless you live alone or are a part of a small family, opting for a large slow cooker is ideal. Another important factor to consider is that for slow cooking, the food should take up at least half of the capacity and not full. This has significant benefits in terms of flavor and taste. Canning different kinds of foods with lower-acids is possible with the help of a good pressure cooker. But can a slow cooker be of use for canning a wide range of foods? According to research, canning low-acid foods such as soups or vegetables is possible with the help of a pressure cooker. This is because a pressure cooker and a pressure canner have the same build and heating features. For example, some pressure cookers come with a pressure gauge which regulate low acid foods for maintaining a certain amount of pressure inside the pot. This cooks the food for a specific period of time, most suitable for fish, meat, soups, and vegetables. Cooking at high altitudes can be hard because the boiling temperature water decreases gradually. So speeding up cooking time and increasing cooking temperature is important. For that, a pressure cooker is more apt than a slow cooker. Here’s how. If you live above 3,000 feet, it means you’re residing at a high altitude. The higher you increase the elevation, the boiling water temperature goes down. In a slow cooker, cooking a pot of beans or noodles is next to impossible because of the slow cooking time. However, in a pressure cooker a pot of beans might take longer than usual to soften, but you can increase the heating temperature to make up for the lost time. This isn’t possible in a slow cooker. Which is safer to use? The old-fashioned steam pressure of a pressure cooker or slow cooking method of a slow cooker. Here’s the best way to find out. You won’t ever see a pressure cooker without an instruction manual. The most important thing to consider when buying a pressure cooker is how it works. So familiarizing yourself with an instruction manual before using one is necessary. That said, you will also find safety instructions about attaching the pressure cooker lid. The lid is what disallows the steam pressure from escaping from the pot. This is important because it dictates the entire cooking process of the cooker. It comprises of a rubber gasket seal along with a steam vent tube. These are the most important and safe components of a pressure cooker. Make sure the seal is clean, rugged, and not rusted or ripped in any way. The steam vent tube needs to be unclogged for the steam to stay locked in. To release the steam pressure from the pressure cooker, do not open the lid immediately. You need to allow the steam to release from the pot completely. Without the steam vent tube, you might burn yourself when releasing the steam pressure. That’s why having a steam vent tube is critical. A slow cooker’s method of heating is easy to understand. It comprises of a removable insert with the integrated heating element at the bottom, positioned above the base of the slow cooker. Modern slow cookers come with a crock that do an excellent job at conducting heat. Make sure the crock material is metal which makes it easier to access and clean. Moving forward, the lid is another critical component of a slow cooker. The most common lid materials are glass or plastic. The former is a reasonable and valuable option than the latter. That’s because with a glass lid you can see what’s cooking inside the pot. So you don’t have to open the lid all the time to check on the progress. If your cooker requires minimal maintenance compared to an older version, you should know that. When you’re serving big crowds, cleaning up is a major worry for most. So before you get started, it’s important that you take this into consideration. The first and most important component to clean of any pressure cooker is the lid. You need to ensure there isn’t any left-over food debris in the valves of the lid. So cleaning or replacing the gaskets after heavy use is important. Modern pressure cookers come with dishwasher-safe components. You can find out which is which in the instructions manual that comes with your pressure cooker. If they aren’t dishwasher safe, washing each component, including every gasket, lid, or valve in warm soapy water is ideal. The gasket of any pressure cooker will eventually rust, so replacing it after every use is important. The best way to know when to replace the gasket is when the pot takes longer to build pressure for cooking. For cleaning an aluminum pressure cooker, you need to soak your stovetop pressure cooker after every use. This will get out tough burnt-out stains that you can scrub with a mild cleaning detergent. Check the instruction manual to confirm if you can use stronger washing agents such as baking soda to clean a burned surface. After you’re done cooking in a pressure cooker, half fill the pot with warm water. Pour a mild washing liquid and soak for at least 60 minutes. This will soften burnt-out stains and other food debris inside the pot. Continuously wash all the parts of the stovetop pressure cooking under running water. You can use a sponge or a hard-fiber cloth with some washing liquid. After rinsing, make sure there isn’t any water stains on the aluminum cooker. You can wipe it dry with a dishcloth, if you have to. Unlike a pressure cooker, not all slow cookers are manufactured equal. They differ in material, size, and shape. For example, cleaning a glass slow cooker requires less maintenance than an aluminum or stainless steel cooker. Take a close look at the cooker’s manual to know the right steps to take when cleaning the pot. The basic things you need to clean your slow cooker are dish soap, baking soda, vinegar, and ammonia. A cotton cloth or dishcloth, and a small-bristle scrub brush is also necessary. Make sure you’ve unplugged the slow cooker from the socket before cleaning or checking for any repairs. Use a damp cotton cloth and wipe down the base of the slow cooker. This requires the mildest form of cleaning, so make sure to gently work your way to cleaning the most difficult parts of a slow cooker. You can dip the cloth in warm soapy water to make sure there aren’t any food stains at the base of the appliance. Most slow cookers come with removable parts. So place down each component carefully before inspecting for any damages. Components like the lib, handles, and knob are generally removable. You can clean them individually with warm soapy water. Use a baking soda and water mixture to clean the exterior surface of the appliance. This will remove any food stains or burnt food from the surface. In a slow cooker, spills and water splashes are inevitable. You can unclog food debris or wipe down food stains from the bottom part of the cooker easily. To clean out the tougher food stains, soak the cooking pot which is the topmost part of the cooker in water and baking soda. You can even use ammonia and vinegar to scrub out the stubborn food stains and debris from the interiors. If a scrub won’t do it, use a toothbrush or a toothpick to dislodge food particles from the surface. There a significant different between a pressure cooker and a slow cooker. You can observe the differences in cooking time, size, energy consumption, and temperature settings. As the names imply, a pressure cooker uses sealed steam pressure to fast cook a meal. While a slow cooker uses low heat to cook meals for a long period of time. There are many ways to work with either a pressure or a slow cooker. But the convenience of it all falls on the shoulders on a pressure cooker. If you’re running short of time and space, a pressure cooker can save the day. On the contrary, if you’re running short of energy, a slow cooker is the only deal to place your bets on. An investment this significant is useless if without careful consideration. That’s where the handiwork and research of this guide comes in. You know what works for you as an energy efficient alternative to traditional cooking methods.